Team of Universitas Indonesia (UI) utilized garbage to make concrete. Garbage of glass bottle that had crushed were used as cement substituter, while concrete waste were used as coarse aggregate. 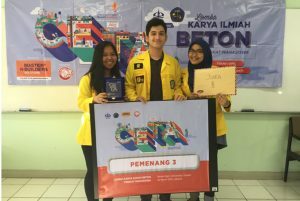 This innovation was created by Muhammad Haikal Syarief, Baiti Rahma Maudina, and Annisa Salsabila that were working as Alkalina Team of UI. The result of pressure test showed that the recycled concrete was a high quality concrete. Moreover, the making of this recycled concrete was considered has economical value since it could save 16% of cost compared to the making of regular concrete. 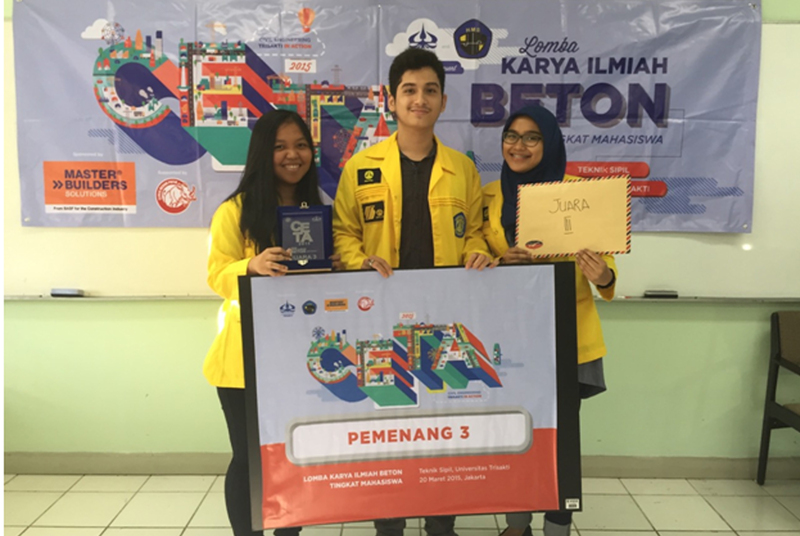 As the reward of their innovation, Alkalina Team of UI successfully got the 3rd rank on Concrete Scientific Work Competition of Civil Engineering Trisakti in Action (C.E.T.A) 2015 that was held on March 20th to April 6th 2015. Activities of this competition were consists of paper and video presentation to assess the scientific work. Beside that, the participant were also asked to do direct molding to assess the mix design process.